We’ve not left much room for the making of things that matter in this modern world. For the careful, private passion of handwork and contemplative creation. Instead of art we’ve embraced certain obsolescence, offshore manufacturing, factory farming, and digital truths that arrive with the half-life of a firefly. Packaging. And yet the tradition somehow endures: homegrown tomatoes, locally brewed beer, hand-knit sweaters. Bits of jewelry. And a few careful songs which still seek to tell private and public truths. At least so long as Guy Clark and his loose-knit confederation of ornery musicians keep writing and recording them. Which makes My Favorite Picture of You, Clark’s first album of new material in four years, a rare and treasured work, a custom creation much like the guitars he fashions on a simple workbench downstairs. It is also, arguably, the most emotional album of his much-decorated career. Consider the lingering memories of its title track, the banked fury of “El Coyote,” and an incautious number titled “The High Price of Inspiration.” And, alas, “The Death of Sis Draper,” a fictional character about whom Clark and Shawn Camp have been writing for nearly a decade. 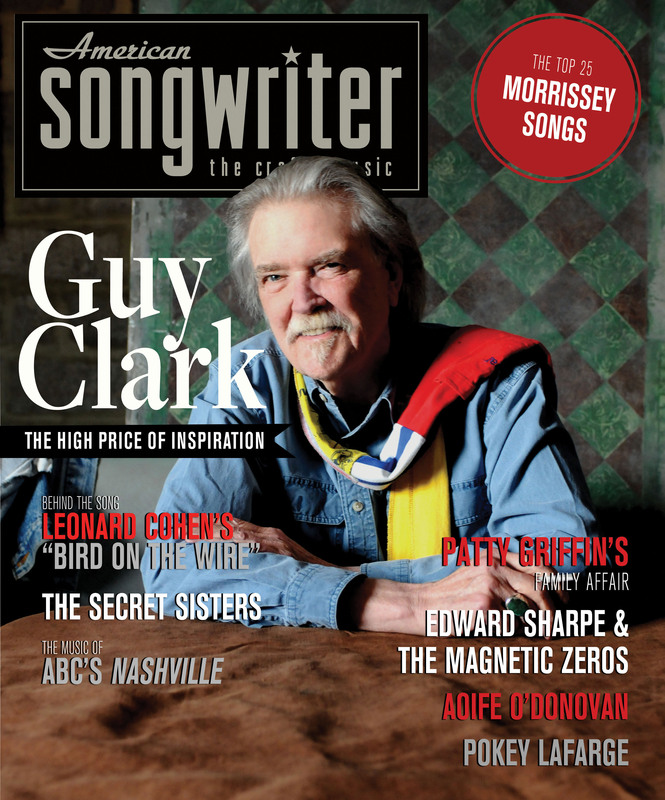 No matter his long tenure at the edge of Music Row, Guy Clark is inescapably from Texas. A resolute, elegant man, regardless the simplicity of his clothes, nor the wear of his 71 years. The elder statesman of a clutch of gritty, gutty songwriters which includes the late Townes Van Zandt, Rodney Crowell, Steve Earle, Lyle Lovett, and Nanci Griffith. And, of course, the late Susanna Clark, who died June 27, 2012. It is her picture which adorns her husband’s new record, the lasting image of his creative partner who so long ago insisted he quit his day job, go ahead and write songs. And then did the same. One day, not twenty minutes. This is not work that he has to do, not at an age when most men are safely retired, except that he does. He’s written enough songs — ”Desperados Waiting for a Train,” “L.A. Freeway,” “The Randall Knife” — to leave a legacy and pay the bills, if that’s what mattered. Formidable talents come through Guy Clark’s door these days, and have for years. Shawn Camp, of course, and his long-time guitarist Verlon Thompson. Chris Stapleton, The SteelDrivers’ original songwriter and vocalist, whose wife, Morgane sings much of the harmony on this record. Gordy Sampson, from Halifax. Noel McKay from Bandera, Texas. Ray Stephenson, Jedd Hughes, Rodney Crowell. Clark does not write angry. He writes carefully, shaving off the unnecessary bits until the story’s told. And yet, at the center of My Favorite Picture of You are two striking topical songs. Angry songs. “Well…I think about that stuff,” is all he offers. Guthrie comes to the foreground of “El Coyote,” a song about a crooked smuggler of people over the Mexican border. “’El Coyote’ was about a situation that really happened,” says Clark. “Something spooked the driver, and he just pulled over to the side of the road, left 18 workers in the Texas sun, and walked off. Locked them in, and they all died. I just thought it was something that needed to be addressed. And Noel speaks really good Spanish, been around that all his life, too. So I presented him the idea of writing that song, and he was very helpful. Add into the mix a cover of Lyle Lovett’s “The Waltzing Fool,” the song Clark made Tony Brown listen to back when, and the result is a formidable collection of songs. A testament to the poetry of carefully wrought songs, and a powerful pleasure.